What a beautiful weekend and amazing day we had for Sunday’s 42ndAnnual New Balance Falmouth Road Race! First and foremost, we’d like to offer huge congratulations to #TeamJAF! 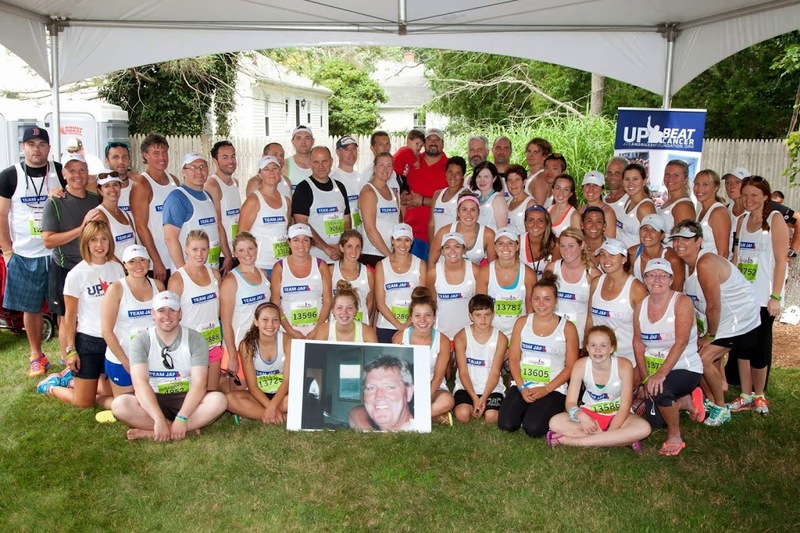 We also want to thank the incredible supporters who joined us on the Cape, cheering on our runners from the sidelines. After months of training and fundraising, I am happy to say the 7-mile race around Falmouth was a huge success. Our 85 runners and their supporters raised $98,841 for the Foundation! Congratulations to our Top Five race finishers, who pushed themselves to the limit for our cause: 1) Mark Lawler, 2) James Brosnan, 3) Chris Vandette, 4) Jack Wheeler and 5) Patrick Martin. In addition, I want to recognize our Top Five fundraisers who went above and beyond the minimum donation: 1) Taylor Joyce ($4,790), 2) Team Andruzzi ($4,027), 3) Tom Papalia ($3,870), 4) Chris Vandette ($3,600) and 5) Julie Gross ($3,183). It was truly a heroic effort by all of our runners. The Foundation and the families it supports thank you from the bottom of our hearts! As the team gathered at the starting line on Sunday morning, the energy was palpable, as was the positive, (Up)Beat spirit of our team, who were ready to tackle the course in support of cancer patients and their families, one mile at a time. At times I can’t believe how much our Foundation has grown in strength and magnitude, but watching our 85 runners cross the finish line on Sunday really brought that home, as did the fact that so many of our supporters shared our message with street signs they held up alongside the course, encouraging our runners. I know I speak for all of our runners when I say that our street sign holders did a tremendous job propelling everyone forward. Between all the volunteers handing out water, Gatorade, orange slices and putting their garden hoses to good use by spraying runners periodically throughout the 7-mile course, it was evident that positivity and encouragement ruled the day! After the race, we were fortunate to gather our team in the Kelley family’s beautiful back yard for a celebratory barbeque, where #TeamJAF, their families and their friends could decompress and salute their hard work. Thank you to the amazing Kelley family for once again hosting us! We’d also be remiss if we didn’t thank our amazing partners, Millennium: The Takeda Oncology Company, New Balance, DigitasLBi North America and Aegerion Pharmaceuticals. We could not have pulled this off without your support! Thanks for a weekend full of memories. We can’t wait to see you on the course next year! If you missed out on the fun, you can still make a donation! Donations close August 24th, and can be made here: http://bit.ly/1rdMcSS. Go #TeamJAF! #UpBeatCancer!